Not only do I have Western District families, I have West Gippsland families. The Combridges, Hunts and Whites resided around Grantville and Wonthaggi. My great great grandfather was Culmer Thomas White, born in Thanet, Kent, England in 1857. Culmer descended from the Culmer and White familes, well-known in Kent for their boat building businesses at Broadstairs. The two families came together around 1714 when John White married Mary Culmer. Culmer’s father, great grandfather and and gg grandfather were all named Culmer White. There are several other Culmer’s including my gg uncle Culmer William White and William Culmer White, Culmer’s 2nd cousin 1 x removed, who also immigrated to Melbourne, and his son Culmer Reuben White. Almost everything I have found in the newspapers about Culmer Thomas White has been a treasure. None more so than this heartfelt letter written to Reverend Henry Howard in 1927 which was then passed on by the Reverend to the West Gippsland Gazette. Culmer was 70 at the time of writing. It is a touching letter as Culmer gives his thanks to Reverend Howard, shows his pride in his children and expresses his feelings at that time in his life, happy but at times lonely. Culmer’s wife, my great great grandmother, was Alice Elizabeth Hunt, daughter of William Henry Hunt and Margaret Beatty, immigrants from Middlesex, England. Alice was born at Chilwell, Victoria in 1857. Culmer died in 1938 at Wonthaggi and Alice in 1940 at Bass. They are buried together at the Grantville cemetery. Culmer and Alice’s youngest child, Myrtle Rose White, married Les Combridge in 1919. They had five children, four daughters and one son. One of those daughters was my Grandma, Mavis Combridge, later to marry Percy Riddiford. Grandma passed away in 2007, but I did get to ask her about her grandparents Culmer and Alice, prior to her death. She told me the story of how she and her three younger sisters would stay at their grandparent’s house. Culmer would pick them up in a horse and cart and they would sit in the back as he drove them to his house. He was a “lovely man” according to Grandma. As is the way, there is still so much I would like to ask her about them. I am very lucky as I still have a living link to Culmer and Alice, via my great Auntie Jean. I have also spoken to her about her grandparents and she reiterated Grandma’s words that Culmer was a “lovely man”. When I found this letter, I printed it out and sent it to Auntie Jean. She was thrilled. I have sent her some of the other articles I have found about him and she has enjoyed being taken back in time. I wish Grandma could have seen this wonderful letter. This entry was posted in Trove Tuesday and tagged Combridge, Culmer, Hunt, Riddiford, White, Wonthaggi. Bookmark the permalink. What a lovely story Merron. It will add richness to your family stories, in addition to the personal ones. Isn’t Trove wonderful and don’t you love those chatty old newspapers?! thanks for sharing. What a wonderful find, Merron, and a lovely post. It’s great you’re able to share treasures like this with your Auntie. and informative! Within modern society honestly, that is really hard to manage. We may be vaguely related – my Great-Great-Grandmother was Martha Culmer White who married John William Plant in Williamstown in 1879. According to family lore (I have no primary sources for the following), she was daughter of John White, who I believe was a shipwright in Williamstown. His father was Culmer White of Kent, who married Elizabeth Jones in 1819 and sired John the following year. I wonder if you might have come across anything which may assist my research. 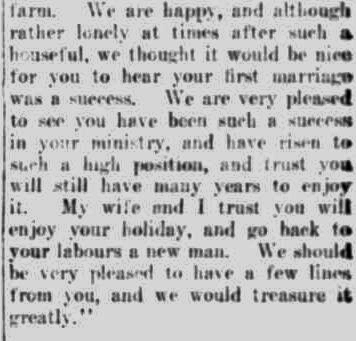 I am particularly interested in JW Plant’s life around the time he married Martha. Thank you so much for contacting me. Yes, we would have some family link. I haven’t done too much on the White family but I know of the boat building link. My Culmer Thomas White was the great grandson of Culmer White born 1793 and Jane Jarman. It is a very interesting history and I will have to do some more on it. I don’t have Martha Culmer White on my tree but I will have a bit of a dig around to see if I can find anything to establish the link with my Whites. Regards Merron. Hi Merron, I am writing some history in relation to early cricket in the Grantville, Bass, Phillip Island and Wonthaggi districts and have seen C T White listed several times in Grantville Cricket Club team sheets. THis includes being hte batting average winner in 1899 with an average of 18. I am also related to the Hunt family so there may be a distant connection somewhere. I would be interested in seeing anything further you have uncovered about this time period. My overall project relates to the impact that the first world war had on cricket in the district – the decline in the sport through the numbers of players that enlisted and what their fates were. Feel free to send me an email, i am happy to pass along the information i find along the way.